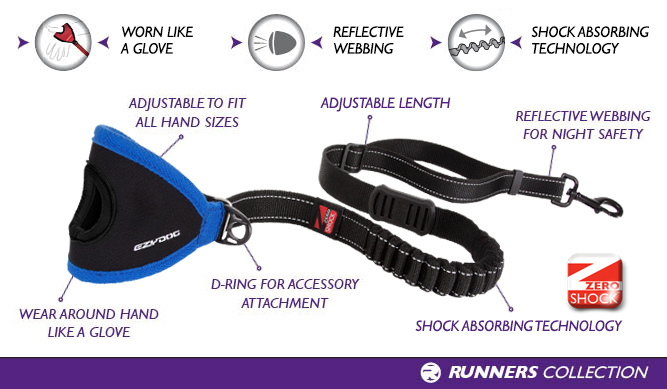 "Extremly happy with the product, easy running for me not having to 'hold' the lead. Strong , durable with 2 very large dogs pulling on it! "I purchased the ‘Handy Leash’ for a friend who is getting a new puppy early December. I already had this item and bought one for my Mum’s dog too. It is the best leash ever, especially with the shock obsorber. You never have to think about holding anything in your hand as it slides straight over and you have full control. Everyone should have this leash!" "I have had hand surgery and an injury to the opposite shoulder. This leash is more than just "handy". 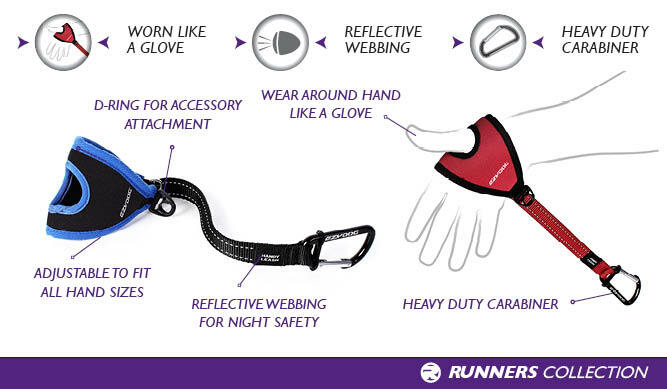 It is exceptionally comfortable to use, provides a feeling of security that the leash won't slip out of my hand and reduces pressure on my wrist and shoulder. I won't go back to a loop of the leash over my wrist. This is so much more effective." "I have always loved Ezydog products and this is a favourite. I have walked with a walking stick in my left hand and a dog leash in my right for as long as I can remember. I bought this leash and for the first time in I can't remember I walked into a shop with my purse in my right hand and paid for goods feeling like a non disabled person for a first time in a very long time. It is comfortable and doesn't feel hot to wear even in our heat. " "This product is amazing ! So comfortable and easy to use. I have a 66kg French mastiff - he likes to pull so my hands can get very sore holding a leash - this took away all the pain of using a regular leash handle. Would very highly recommend this to anyone - it has a multiple of uses so get on to it , you wont regret it !" "As I am in a power wheelchair, I either have to hook my dog lead to my waist or the chair itself, as trying to hold onto a leash caused all sorts of problems. But now I can just slip the handy leash on and have control of my dog and the chair at the same time." "I love to take my dog for a walk but find it hard to keep my hand clenched to hold onto his leash. With the Handy Leash, I just slip it over the thumb and his weight keeps it nice and tight without having to close my hand. I have found that my fingers are no where near as sore tonight after our walk. I would highly recommend it for anyone who has arthritis or any other hand injury."